We’ve all heard the digital marketing mantra that “Content is King.” No matter what strategy you employ to get noticed, every single marketing professional has probably told you about the value of content across multiple outlets. Without effective content marketing coming from all the critical online channels, your campaign will fall flat on its face, or, so they say. But what if this widely accepted marketing “truth” doesn’t carry as much substance as it once did? The reality of today’s content marketing climate is that quality content creation isn’t enough. For today’s demanding consumers, it’s context that is beginning to really matter. In the old days (which was only a few years ago), people would primarily search for something using a search engine on an Internet browser. Today, however, the shift to mobile is loud, clear, and here to stay. And, its apps that are leading the way in this new consumer trend. This shift toward app-based interactions and away from traditional search engine queries is exactly where context plays a critical role. As PCWorld contributor Zach Miner described in a related post, context is all about identifying consumer signals and delivering the content they want which matches those signals. Signals refer to what a person is doing right now on their phones or other mobile devices. And connecting targeted advertising based on those signals is where the importance of context truly shines through. For example, let’s say your calendar app has an appointment scheduled at 11:30 AM that you’ve forgotten about, and you’re 2 miles away from the office talking to a friend on the street at 11:20. A contextual approach to your apps could provide you with a final notification about the looming meeting – and immediately recommend an on-demand ride service which has the shortest wait time to get you back to your office as quickly as possible. Signal-based contextual ads can get potential customers to act now because you’re giving them exactly what they need at that moment. And there are no better leads than those who are ready for whatever it is your business offers. Contextual and history-based searches are already a big part of Google’s current approach. That’s why it’s important to target local cities or neighborhoods to better reach your target audience. However, Google is only one section of a mobile user’s app library. This is where integrative technology is beginning to take context even further than just your Google apps. Platforms like Everything.me help to connect all your apps together to provide a much more intuitive, contextual solution to how you interact with them. Marketing within this sector can transform how you connect to your target audience – and give them a much more compelling and immediate reason to choose your business. Let’s go back to the meeting example from above. Say you got caught up in a conversation and didn’t check your phone – missing your meeting. A contextual advertising campaign could deliver a timely notification which says “Sorry you missed your meeting – bummer! Have a coffee on us,” from a coffee shop near your location. Can you see just how much potential this type of contextual integration could have within marketing? And the good news is that this is exactly where the technology is taking us right now. Does all this fuss about context mean that you should throw out your content marketing altogether? Not a chance. When your target audience is in search of something from you, they still seek out value from the content you provide. However, there needs to be a contextual link that brings them to your content (rather than a simple keyword-based search engine approach). So let’s not rush to throw out content marketing as a big part of successful digital marketing campaigns just yet. Think of the context as the “gates” of a kingdom (your website). The gates are what you need to lead people to your website and your content. It’s the content itself that provides the value which inevitably converts leads into customers. If you’re not including context in your marketing, you’ll quickly be left in the dust by your competition. The more you start to focus on context now, the better your content marketing strategy results will be as this technology continues to improve. 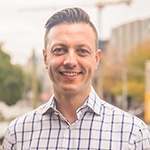 Author Bio:Sam McEwin is the founder and Director of Melbourne based digital marketing agency BizWisdom. Sam enjoys sharing his passion for data driven digital marketing with businesses who love what they do and who are looking to grow their business online. Sam loves nothing more than nurturing client relationships and transforming ideas, no matter how big or small, into success stories. Sam is a regular contributor to BizWisdoms’ blog and guest speaker at digital media industry events and workshops.